I saw these cute little brownie bites over at Multiply Delicious. They looked so fun and festive, not to mention delicious, so I decided to give them a try. Instead of making brownies from scratch, I used a box of brownie mix, baked in a 9 x 13 inch pan. These make a very pretty little dessert to add to your dessert tray, but are incredibly time consuming. First, it takes a lot of time to cut out all of the little brownie circles, especially since the brownies stick to the cookie cutter. Multiply Delicious suggests dipping the cutter in powdered sugar to prevent sticking, but I just ended up with sticky brownies with white globs of sugar when I did this. So, I ended up rinsing my cookie cutter several times during the process. The next time consuming bit was slicing each cut out in half. There was the same stickiness problem as before, plus if I wasn’t careful, the brownies would fall apart. This could be because I used box mix instead of making the brownies from scratch. 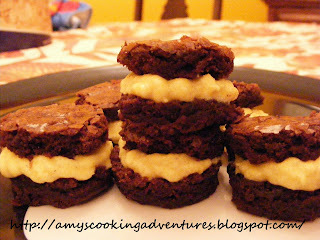 If I were to make these again, I think I would save some time and energy by just frosting the whole pan of brownies with the pumpkin cream cheese mixture. That way, I still get the nice pumpkin/chocolate combination without all the work. Not as pretty, but still yummy! Bake brownies in a 9 x 13 inch pan, according to package directions. Cool completely. In a mixer, cream butter until smooth. Once butter is smooth, add creams cheese and continue to whip until smooth. Gradually add confectioner’s sugar on medium speed until smooth, about 3 minutes. Add the pumpkin and spices, whip until smooth, scraping the bowl as necessary. Transfer filling to a pastry bag with a snipped end or a large decorating tip. Note: if you do not have pastry bags, you can use a heavy duty zip lock bag with one corner snipped. 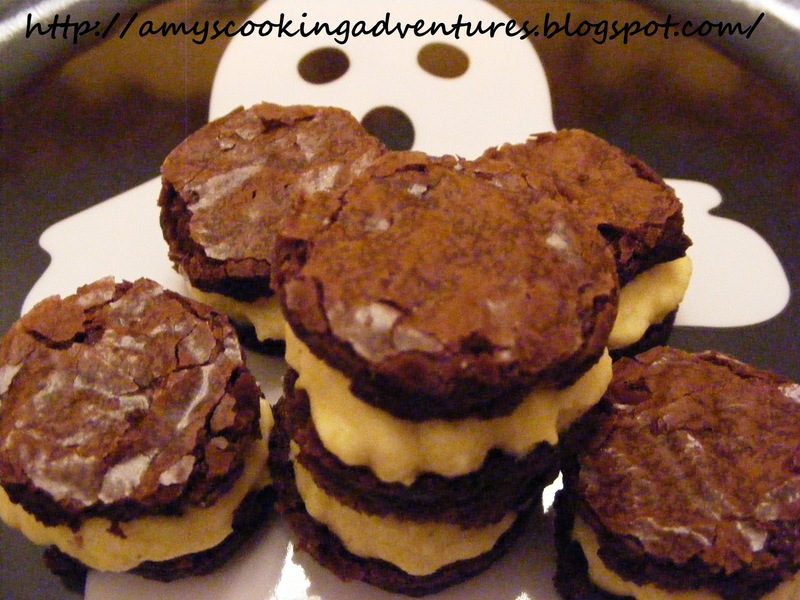 Cut cooled brownies into rounds using a small 1 inch round cookie or biscuit cutter. Cut each round in half. Pipe a large dollop of filling onto the bottom half of each circle. Place the tops back on, pressing down gently so the filling spreads evenly to the sides. Place brownie bites to an airtight container, separating layers with waxed paper. Refrigerate for at least 30 minutes before serving. Store in refrigerator up to 5 days. Amy, how much pumpkin are you supposed to use? Sorry about that! 1/4 cup! Thanks for the heads up!